Prophet, Priest and King are the principal offices that define the Kingdom-building work of our Lord Jesus Christ. The last Book of the Bible is "The Revelation of Jesus Christ"—God's "Amen"—the Seal of Himself. Jesus is not a second or third fraction but "Emmanuel . . . the beginning of the creation of God" revealed in flesh. "And without controversy great is the mystery of godliness: God was manifest in flesh [to fulfil the part of our kinsman Redeemer], justified in the Spirit, seen of angels, preached to the Gentiles, believed on in the world, and received up into glory" (I Timothy 3:16). Of whom John wrote, "That which was from the beginning, which we have heard, which we have seen with our eyes, and looked upon, and our hands have handled, of the Word of Life; for the Life was manifested, and we have seen it, and bear witness, and show you that eternal Life, which was with the Father, and was manifested to us" (I John 1:1-2). This mystery was sealed from the foundation of the world and revealed in these last days by "the seventh angel" of Revelation 10:7, William Branham (1909-1965), the "Elijah" of Malachi 4:5-6 and Matthew 17:11, to show Christ's end-time Bride her place in the Body so she can fulfil her part of the Word. Until Christ opened the Seals and revealed them to His Prophet the mystery of God was signified by symbols from the Temple in old Jerusalem. That temple was a shadow and type of Jesus and His Bride, the true spoken Word Temple or dwelling place of the living God and the eternal substance of the Logos which cast the shadow Solomon made with hands (II Corinthians 5:1; Acts 7:47-50). Thus the revelation of the Seven Seals unveiled the mighty God before us. "In the New Jerusalem I saw no temple: for the Lord God Almighty and the Lamb [and His Wife] are its Temple" (Revelation 21:22). The material things of this world are a shadow and foretaste of eternal things in the renewed heavens and renewed earth. Temporal difficulties and trials overcome by the Word of God and prayer perfect our faith, clothing us with the nature and character of Jesus Christ, approved to exercise dominion and rule over God's redeemed creation through all eternity. We must exercise faith in God's creative Word in order for Jesus' 'third pull': "Be perfect as your heavenly Father is perfect" to manifest in us (Matthew 5:48). The word "perfect" is (Gk.) 'teleios' which means "brought to its end, finished; wanting nothing necessary to completeness; perfect; consummate human integrity and virtue; full grown, mature men". Hebrews 5:8-9, "Though He were a Son, yet Jesus learned obedience by the things which He suffered; and being made perfect, He became the author [or cause] of eternal salvation to all who obey Him." In Hebrews 12:1-14, Paul takes Jesus as his Absolute and explains that in order to overcome we must learn obedience and welcome chastisement whose purpose is to bring us to correction by identification with the Absolute of God's unchanging Word so that we are liberated from this world, "made perfect," complete, lacking nothing, mature with the Token of the Life of Christ on display. Ephesians 4:11-16, "Jesus appointed certain men to the fivefold ministry as apostles, prophets, evangelists, pastors, and teachers; for the perfecting (Gk. 'katartismos': "to mend what has been broken or rent, perfectly join together, to equip, put in order, adjust, ethically strengthen, perfect, complete and make one what he ought to be") of the saints, for the work of the ministry, for the edifying of the body of Christ: till we all come in the unity of the faith and of the knowledge of the Son of God to a perfect (Gk. 'teleios' mature, complete) man, the measure of the stature of the fullness of Christ: that we should no longer be babes, swung back and forth, and carried here and there with every wind of doctrine, by the sleight of men, and cunning craftiness, whereby they lie in wait to deceive; but speaking the Truth in love, may grow up in every way into Him, who is the Head, into Christ, from whom the whole body is joined and knit together and united by every joint with which it is supplied, so that the whole body is healthy and building-up itself in love". 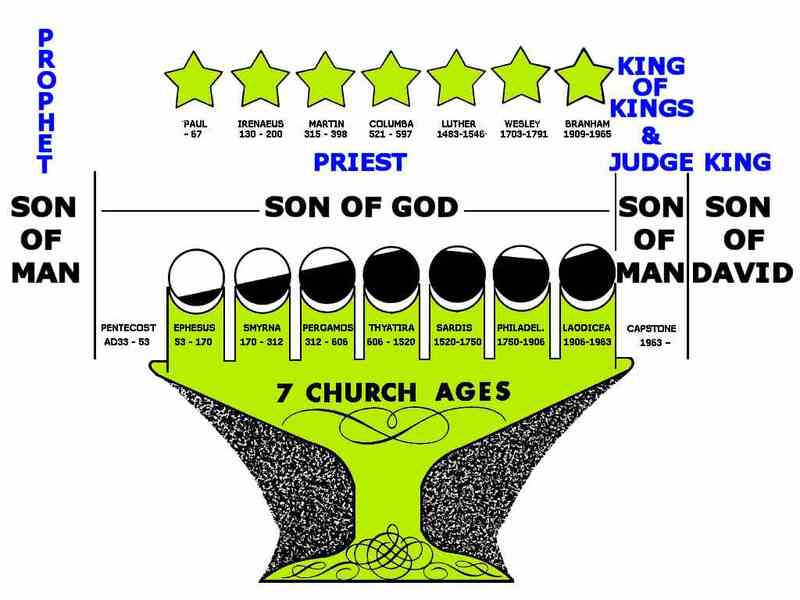 Observe the virtues, evidences or tokens for each Age displayed on this diagram according to II Peter 1:1-8 and notice, "till we all come to mature manhood" is not speaking of the individual saints but of "the whole body fitted together and united by every joint with which it is supplied, so that the whole body is healthy and building-up itself in love." This should eliminate a certain confusion that has been disseminated within local assemblies here and there. 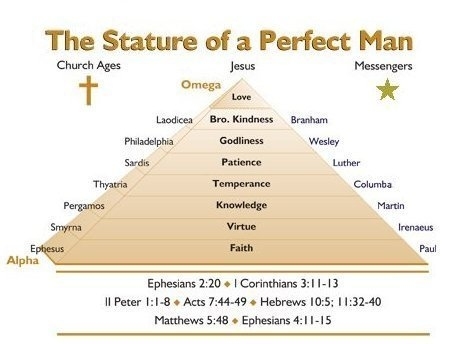 Our Brother Branham's diagram portrays the Bride of all Ages growing into the measure of the stature of the fullness of Christ as He commanded: "Be perfect even as your heavenly Father is perfect". Adam's race has laboured against sin through six thousand years reaching maturity in this Capstone Age. So the Law and ordinances were a shadow of good things to come and Moses' heavenly vision was for the purpose of instructing and guiding Israel back to fellowship in the Presence of God. Moses did not see the Lamb and His Wife, the glorified New Testament saints; he saw our "pattern" as a functional temple and built its transportable similitude from the resources in the wilderness. Solomon subsequently built a "temple made with hands" which would be razed by Nebuchadnezzar, God's servant, as Ezekiel would have understood when he learned of Jerusalem's destruction recorded in chapter 33 according to his prophecy in chapter 24; the Temple is not mentioned as the Lord had abandoned it eight years before. Zerubbabel restored the Temple which Herod later glorified and God's servant Titus destroyed it according to Ezekiel 9. Solomon's Temple was mere shadow; the Lord abandoned it before Nebuchadnezzar destroyed the city and He NEVER returned. So although the children of Israel found rest in the land of the Covenant and built a Temple, Isaiah 66:1-2 says, "The heaven is My throne, and the earth is My footstool: where is the house that you build unto Me? And where is the place of My rest? For My hand has made all those things, and all those things have been [in the past], says the Lord: but to this Man will I look [for My temple and dwelling place], even to Him that is poor and of a contrite spirit, and trembles at My Word." This brings us to the Lamb of God and His Wife in the New Jerusalem. In the visions of Ezekiel 1 and 10 His Ark or throne was still travelling on wheels and did not rest till He took His abode in Jesus Messiah at the Jordan (Matthew 3:17). Today He has abandoned the denominations to (Heb. 'cherem') utter destruction for His glory by Judaeo-Communism, His servant, and for the same sin as He destroyed the Temple (Matthew 25:1-13; Revelation 18:4). Hebrews 9:21-24, "Moses sprinkled blood on both the tabernacle and all the vessels of the ministry." (For the tent and the instruments used for worship represent the corporeal and individual elect of God under the Spiritual covering of Shem as prophesied in Genesis 9:27 and implied in Brother Branham's "tent vision"). "Indeed, under the Law almost everything is purified by blood, and without the shedding of blood is no remission. So it was necessary for the copies of the heavenly things to be purified with these rites, but the heavenly things themselves with better sacrifices than these." (You and every elect soul are these "heavenly things"; the "better sacrifices" is the one sacrifice of our kinsman Redeemer, the last Adam, once offered and more excellent than the many continual Levitical sacrifices. Christ's expiatory sacrifice was His "ministry of reconciliation" (II Corinthians 5:18-21; Romans 8:28-30) that did away with the influence of human sin on the heavenly sanctuary such that when the last end-time Bride is complete it will have the effect of casting Satan down to earth, glorifying the sleeping saints, enabling us to manifest the 'third pull' in sin-born flesh under pre-eminence to the Word and change in the atoms to meet the Lord in the Air). "For Christ did not enter into a sanctuary made with hands, which are types of the true; but into heaven itself, now to be manifested in the Presence of God for us". A PROPHET is a mediator between God and men, speaking to the latter in the Name of the Former (Deuteronomy 18:15-22). He is the God's mouthpiece and speaks only what he has heard by inspiration from God (Jeremiah 1:9; Isaiah 6:5-10; John 8:26), or what God has shown him by vision or dream (Numbers 12:6; John 5:19-20). Through the prophet Moses, God commanded Israel not to adopt the moral religions and customs of the Serpent's seed nations from whom they would dispossess the Promised Land. Deuteronomy 18:16-19, "According to all you desired of the Lord your God at Horeb in the day of the assembly, when you said, Let me not hear again the Voice of the Lord my God, neither let me see the Shekinah any more, lest I die. And the Lord said to me, They have spoken well. I will raise up for them a Prophet from among their brethren, like you, and put My Words in His mouth; and He shall speak to them all that I command Him. And whoever will not pay heed to My Words which He shall speak in My Name, I Myself will require it". Moses was prophesying of Jesus Messiah, who alone was comparable to Moses in His mediatorial character, in the peculiar excellence of His ministry, in the number, variety and magnitude of His miracles, in His close and familiar communion with God, and in being the author of a new dispensation of the faith (Acts 3:22-23; 7:37). As Moses introduced the Law, "which was Israel's schoolmaster to bring them to Christ, that they might be justified by faith" (Galatians 3:24), Jesus was the Israelite "prophet like Moses" who met the requirements of the Law and fulfilled the part of kinsman Redeemer in God's plan of redemption. Particulars pertaining to Messiah are scattered through the Words of so many prophets, yet all converge in Jesus—the race, nation, tribe, family, birthplace, miracles, humiliation, death, crucifixion with the wicked, and association with the wealthy at his death, resurrection, and the extension of His seed, the Church—are so numerous that their minute conformity can only be explained by believing that the prophets were moved by the Holy Spirit to foretell these events. The Old Testament is said to contain 333 prophecies regarding Messiah, most of which were fulfilled by the first Coming of Jesus Christ. Even the most liberal critics acknowledge that these prophecies were written at least 400 years before His birth. Mathematicians have easily shown that the odds of all these prophecies being fulfilled by chance in one man is greater than the number of atoms in the universe many times over. The self-styled Jews and Israelites would certainly not have corrupted the prophets in order to confirm Jesus' Messianic claims, which they reject. And the prophetic details are so complex, and seemingly inconsistent, that before the event it would seem impossible to make them coincide in one person. A "Son," yet "the everlasting Father"; a "child," yet "the mighty God"; "Prince of peace," sitting "upon the throne of David," yet coming as "Shiloh" (the peace-giver) when "the sceptre shall depart from Judah"; "Son of David," yet "Lord of David"; a Prophet and Priest, yet also a King; "God's Servant," upon whom He "lays the iniquity of us all," "Messiah cut off," yet given by the Ancient of days "an everlasting dominion." The only key that opens this immensely complicated lock is the Gospel narrative of Jesus, written ages after Israel's prophets; but like the prophets, the Gospel has been rejected by Israel. It is essential that we as end-time Christians clearly understand that a prophet is one with whom the Lord communicates in visions and in dreams and by inspiration—even "mouth to mouth" (Numbers 12:6-8) as He spoke with Moses, Jesus Christ, and Brother Branham. The vindication of a prophet requires that everything he speaks in the Name of the Lord is in perfect accord with the Words of every previously vindicated prophet, and that it comes to pass according to his words (Deuteronomy 13:1-5; 18:15-22). A word is a thought expressed, and as God's thoughts are eternal He is not now thinking or even taking counsel with Himself for all His thoughts He has always had. Therefore His Words are real and will come to pass in their designated and decreed season and time (Habakkuk 2:3; Malachi 3:6; Hebrews 13:8). The Word of God comes first hand through His servants the prophets; we receive it secondarily. As the prophet and his Message are one, Christians are "written epistles" of the Word for their day (II Peter 1:20-21; II Corinthians 3:2). Hence the Psalmist says, "Touch not My anointed, and do My prophets no harm" (Psalm 105.15). God does not make mistakes, and as we read in Deuteronomy, the false prophet shall be put to death, while the person who does not hearken to and obey the THUS SAITH THE LORD of His vindicated prophets will answer to God (Revelation 22:17-19). Amos 3:7, "Truly the Lord God will do nothing without first revealing His secret to His servants the prophets." Who was he? Where did he live? What was his Message? And what does it mean? A prophet is a sign from God: a sign of coming judgment. His Message offers God's grace and the way of escape. Our eternal destiny is dependent upon receiving and understanding the Message of God's prophets, specifically the Message of His Covenant Prophet in this end-time, William Branham. Peter said, "Every soul, who will not hear that prophet, shall be destroyed from among the people" (Acts 3:23). Brother Branham is the Covenant prophet promised in Malachi 4:5-6 and Matthew 17:11 who directed John throughout the Book of Revelation. Outside a clear understanding of his Message there is not the remotest possibility of being born-again in this day, and the certainty of the tribulation. Unless you have a personal revelation from God that He promised a prophet to this day and understand from your Bible what he would do you are without the Spirit (John 16:13) and ignorant of the present Truth—what Jesus is doing now. Whoever that man was he has already fulfilled the Scriptures. Until you identify that prophet, prove his vindication and his Message you are walking in Darkness. And if you believe William Branham was that Prophet but have not personally proven his vindication and his Message, you are resting on psychology and not faith. Tradition is very powerful and ensures the compliance of those who seek the approval of men rather than taking the path of the despised few and "receiving the word with all readiness on mind, then searching the prophecy of Scripture, whether those things were so." However, the "letter" of his Message without faith to know what it means is the "spirit of strong delusion" prophesied by Paul. Faith is not reading tea leaves but the infallible mind of God in you by a clear understanding of His revealed Word. Unless we are walking in the Light of the present Truth—what Jesus is doing now—we are deceived. A PRIEST is an advocate who presents himself as the representative of another. As a mediator he intercedes in the Lord's Presence in behalf of His people, His elect and holy nation, and prepares a way by which they themselves might approach Him. As such he instructs them in the way of righteousness and holiness—and is to be so himself for he is also God's representative and partaker of the sacrifices living from the tithes (Leviticus 9:9-11, 17; Malachi 2:7; II Corinthians 5:18-19; I John 2:1; I Peter 2:5, 9-10; Revelation 1:6). he offered gifts to God and took back gifts from God (Numbers 18:8; I Corinthians 9:13-14; Hebrews 5:1-4). Numbers 16:5, 40, "The Lord's . . . holy [and] . . . chosen . . . come near . . . to offer incense (a type of prayer made pleasing by faith) before the Lord" (Psalm 141:2; Revelation 8:3). This right and duty was reserved exclusively to the priest (II Chronicles 26:18). All Israel was originally chosen as a kingdom of priests to intercede in behalf of the Gentiles of Adam's race (Exodus 19:6; Isaiah 42:6; 49:6; 51:4). But Israel renounced the obligation through fear of the nearness of the Presence of the Lord (Exodus 20:18-19), and God accepted their renunciation (Deuteronomy 5:24-28; 18:16-17). Moses became their mediator with God, and the Aaronic priesthood became Israel's priesthood until Christ, the antitypical High Priest and Mediator should come. Every New Testament saint whether male or female, Israelite or Gentile, is a priest (or intercessor with God), but not five-fold ministers (I Peter 2:5, 9; Galatians 3:28), and in the regeneration we shall reign with Messiah as king-priests (Revelation 1:6; 5:10; 20:6; Ephesians 5:26). The five-fold ministry is not a priestly office for Christ has an unchangeable priesthood as "He ever lives" (Hebrews 7:23-25), and unlike the Aaronic priesthood and the papacy He need not transmit the priesthood to successors. Since Christ is the sole representative of the high priest and needs no assistance in His priestly duties the Aaronic priesthood has passed away (Hebrews 10:1-23). He is not said to be after the order of Aaron (as the Aaronic priesthood was imperfect) but "after the order of Melchisedec". Israel was chosen to be the royal priesthood with respect to the other nations, or Gentiles (Isaiah 42:6; 49:6; 55:5), though incapacitated by its natural sinfulness and therefore not realized in fact. This makes the folly of Christian Identity, British Israel theory manifest. By its incessant transgressions of the very Law through the fulfilment of which it was to be sanctified to enter the Presence (Exodus 19:21), it required the priesthood as a separate element which by its existence represented the nation as yet unfit to approach God (Hebrews 9:7-11). The priesthood was calculated to keep alive their consciousness of man's estrangement from God, and the people offered their gifts to God by means of this separated class and in connection with the propitiatory sacrifices (Exodus 19:3-6; Numbers 3:12-13; 18:20-24; Deuteronomy 7:6). The insufficiency of the priesthood itself was expressed by their being excluded from the Most Holy Place. The chief priest alone had access only once a year when the entire guilt of the nation was to be atoned for, and to enter, laid aside his magnificent robes of office to officiate in a plain linen garment (Exodus 29:36-43; Leviticus 16:1-4; Philippians 2:7-8; Hebrews 2:6-18). He had to confess his own sin and bring a sin-offering (Leviticus 6:3, 6, 11, 14). Then he presented the atonement for the congregation and the gifts of a reconciled people (Leviticus 16:5, 7-10, 15-23; 23:27). Finally, he brings back from the Presence the blessing of grace, mercy and peace (Numbers 6:22-27). In the patriarchal age before Moses, the head of a family performed the priestly acts and drew near to God, for instance, Abraham, Isaac, Jacob, and Job (Genesis 12:8; 18:23; 26:25; 33:20; Job 1:5). Melchisedec, who became Jesus Christ, was King-Priest (Hebrews 7:1-3). Jesus Christ our King-Priest descended from the kingly lineage recorded in Matthew 1, and also from a lineage recorded in Luke 3 that includes many priests: Levi, Eliezer, Malachi, Johanan, Mattathias, and Heli—not of the priestly stock—but patriarchs who exercised the priesthood, delegating it to their first born or favoured son who became a Nazarite, separated from among his brethren (Genesis 27:15; 37:3; 49:26; Deuteronomy 33:16). The priests mentioned in Exodus 19:16, 24; 24:11 may have been the firstborn or heads of the tribes and families as we find the 150 princes of Reuben who rose up (Numbers 16:2). At the time of the exodus the first-born were specifically claimed by God for His service. Subsequently, the Tribe of Levi was taken as a substitute for the firstborn—not upon right or privilege but by God's sovereign grace (Exodus 19:5-6; Numbers 3:12-13; 8:5-22). Only those called by God and sanctified by Him can represent the people (Numbers 16:7; Hebrews 5:4). This was symbolized in Aaron's rod which budded but which was in no way distinguishable from the other rods but was a sign of the Power of God's grace which replenished him in office. The priest was to have no bodily defects or imperfections and the High Priest could only marry a virgin as he was a type of Christ who is only marrying a virgin to the Word, not a denominational harlot (Leviticus 21). Priestly succession depended on the sureness of the genealogy, these genealogies (in which mothers as well as fathers are named) were jealously preserved and referred to in disputed cases (Ezra 2:62; Nehemiah 7:64). The ordinary priests could marry the widow of another priest (Ezekiel 44:22). The priests could drink no wine during the time of their ministrations and were not permitted to minister in the Tabernacle until twenty-five years of age (Leviticus 8:24; 10:9). In the antitype we see the distinction between the born-again elect and the "saved" foolish virgin. c) anointing — a type of the New Birth. Moses, the "servant of Jehovah," is fitly the consecrator and sanctifier throughout these ceremonies because, as the channel through which others receive this Office, he has for the time a higher priesthood than that of Aaron. As Moses divested himself of the priestly Office and transferred it to Aaron, the ascended Christ has transferred His earthly ministry to us (II Corinthians 5:18-21; Ephesians 4:11-12; I Peter 3:15). Every Christian is a priest, but God has taken to Himself and set in the Church the Gift of five different Offices of ministry to serve His holy people: to keep them clean and bring them to maturity through revelation of the Word, for the exercise of their priesthood in reconciling sinners through personal testimony when they ask a reason of the hope that is in them. a) a sin-offering of a bullock (Exodus 29:10; Leviticus 8:14)—signifying that they who seek to serve in the ministry of reconciliation must first themselves be reconciled. By laying hands on the bullock as sin offering they typically transferred their guilt to it as we identify with Christ who took upon Himself our guilt. b) a burnt offering of a ram, a "sweet savour" indicating a totally surrendered life. The blood was sprinkled on the sacrificial horns of the altar, showing the candidate was not yet in possession of the priesthood. The blood of the second ram of consecration was applied to the candidate as his actual investiture into Office. The blood applied to his right ear implied its openness to hear God's voice (Psalm 40:6; Isaiah 1:5). The blood on the right hand, his duty to dispense or distribute what had been heard, and the blood on the right foot signified a holy and consistent walk in God's ways. Lastly, Moses took portions of the sacrifices with the cakes of unleavened bread and blessed them in the hands of the candidates, and after presentation to God as a heave offering; all was burned. This symbolized the transfer of the priestly function of offering the fat upon the Altar of God and the conveyance of the right to receive certain gifts from the Altar for themselves. But as the priest was not yet properly consecrated, the portion is not yet given to him but to God by fire. c) The above ceremony known as the "filling of the hand" meant to consecrate (Exodus 29:9; II Chronicles 13:9), and communicated the authority to exercise the Office of priesthood. It was repeated for seven days, during which they stayed in the tabernacle, separate from the people (Leviticus 8:31-36). This was the third part of the three-fold sacrifice. The consecration was transmitted from father to son and required no renewing. Only on the eighth day did he commence his priestly function, as on the eighth day Christ resurrected and commenced His Priesthood by cleansing the heavenly temple of the sins of the Old Testament saints with His own blood. And on the day following the seven sabbaths of the Pentecostal Feast or Gentile dispensation the end-time Bride takes the open Book of Redemption from the hands of Christ and comes into the unity of the faith, for the fiftieth day of the Pentecostal Feast is likened to an eighth day in that it is a restoration to the faith once delivered to the apostolic saints. Entering this holy convocation by the revelation of the Seven Seals we commenced our priesthood "to many peoples, and nations, and tongues, and kings" (Revelation 10:8-11) with authority to speak the Word in the manifestation of the Sons of God. The holy garments of the priest represent his Office. They were first worn at the consecration and preserved in the Temple when not actually required. They were holy garments for "glory and beauty." They consisted of FOUR parts, all of which were required to be worn that he dies not (Exodus 28:35, 43). The turban and coat were a shining white, typifying Light wherein God dwells (Exodus 34:29; Psalm 104:2; Daniel 2:22; 7:9; I Timothy 6:16). So His ministers should minister in the earthly sanctuary in livery emblematic of His ministry in the heavenly sanctuary. White is the only pure colour; white linen reflects the purity of God and represents the righteousness of the saints (Ezekiel 10:2, 7; Daniel 12:6; Matthew 17:2; 28:3; Acts 10:30; I Timothy 6:16; Hebrews 1:7). God loves holiness and forbids hybridizing. This is declared in the law of reproduction and symbolized in the ban against wearing garments of diverse threads such as wool and linen (Leviticus 19:19; Deuteronomy 22:11). This white—holiness and purity—completely covered the body down to the feet and adhered closely to the body with tight sleeves and the neck drawn together by a band. It was altogether woven, without seam like Christ's garment, a symbol of entireness, perfection and spiritual health. Though entirely white it had a chequered or variegated pattern wrought in it (Exodus 39:27-29; 28:1-8). It was gathered round the body with a girdle of needlework (Exodus 28:39) which was only to be worn during the time of officiating as it was a sign of office. (It went round about the breast rather than the loins then around the waist and hung loosely down to the ankles whilst the priest was not engaged in laborious service, for in that manner it had its most agreeable appearance to the spectator. So he wore it before the Altar of Incense when interceding. But when he was obliged to assist at the offering of sacrifices, in order that he might not be hindered in his priestly operation by its motions, he throws it to the left, and bears it on his shoulder). It was about four fingers broad and was loosely worn and embroidered with flowers of scarlet, purple and blue, the colours of the Temple, but only the warp was linen and therefore white. Revelation 1:13, "And in the midst of the seven candlesticks One like unto the Son of Man, clothed with a garment down to the foot, and girt about the breast with a golden girdle." Here we see a symbol of the glorified Christ in the midst of the churches. It is the Lord's Day; for John sees Him standing, not as a priest but as the coming Judge. The golden girdle is no longer girt around the waist where the priest must wear it as he ministers to God in the Holy Place but it is now around His shoulders, for He is not now the priest but the Judge. John 5:22 has come to pass, "For the Father judges no man, but has committed all judgment unto the Son." His service has been rendered. The priesthood is over. The ordinary priests wore at all times a bonnet or cap resembling in appearance a helmet signifying joy in their salvation: in Israel, uncovering the head was a sign of grief or mourning the dead and the priest was not to be associated with death but Life (Leviticus 10:6; 21:10). Hence Isaiah 59:17; Ephesians 6:17; I Thessalonians 5:8. The High priest wore a wound mitre or turban. The last item was the linen trunks that reach from the loins to the middle of the thighs "to cover their nakedness" (Exodus 28:42-43; 39:28; Ephesians 6:14). In all their ministrations the priests were barefooted to preserve the sanctity of the tabernacle (Exodus 3:5; Joshua 5:15). a) Mediatorial—to keep the sacred fire ever burning on the sacrificial Altar (Leviticus 6:12-13); feed and trim the lamp stand; offer the morning and evening whole offerings (Numbers 28:9-10) accompanied with a meat and drink offering. Then there was tending to the lamps; replacing the showbread, offering first-fruits, estimation of commutation in money for extraordinary vows for any devoted or unclean beast, house, field, etc. These were fixed duties which never varied. Their chief function was to be always ready at their post of duty, to do the priest's office for any guilty, penitent, rejoicing, or thankful Israelite. The worshipper may come at any hour. b) Teachers and guardians of the Law of God (Leviticus 10:10-11; Deuteronomy 33:10). From their knowledge of the Law which was at once civil and ecclesiastical, they were to act individually, and collectively as a court of appeal in the more difficult controversies in criminal or civil cases (Deuteronomy 17:8-13). Under THUS SAITH THE LORD of the Law and the prophets, fresh revelations or new enactments could not be made by the priest or anyone else, the Urim and Thummim of the high priest was the only exception. The priest had simply to explain the given Law—"Law to the priests, counsel to the wise, and the Word to the prophets" (Jeremiah 18:18). Nowadays "Halacha is the Jewish national legal system" even though the Babylonian Talmud "makes the Word of God of no effect" (Matthew 15:1-9). c) They were to be referred to in the case of undetected murder (Deuteronomy 21:1-9). They were to bless the people at every solemn meeting and after the regular daily service (Numbers 6:22-27). During the journeying in the wilderness the priests were required to cover the Ark and all the vessels of the Sanctuary with a purple or scarlet cloth before the Levites approached them (Numbers 4:5-15). They were to blow the Trumpets. Only the priests could blow the Trumpets, not the Levites. Under Joshua they received thirteen of the forty-eight cities of refuge assigned to Levi. They had no inheritance in the Land (Numbers 18:20-24; Ezekiel 44:28). The priests of Jehovah were NOT to be wealthy. The maintenance of the priests depended upon the blessings of God or the religious condition of the nation so they had a duty to ensure Israel was meeting the requirements of God's Covenant. David divided the priesthood into 24 courses, each with a president. As the three sections of the Tabernacle were separated with extreme severity, so the three orders of ministers. The LEVITES were the appointed servants of the court, but they were excluded from the holy Place on pain of death. The PRIESTS executed the ministry of the Holy Place but were as solemnly prohibited from entering beyond the veil into the Holy of Holies. The priesthood culminated in the HIGH PRIEST as mediator between God and the people. He was set apart to represent the nation in order to "bear the iniquity of the holy things, which the children of Israel shall hallow in all their holy gifts" (Exodus 28:38). Hence the offerings are sanctified by the appearance of the high priest as an atoning mediator before God. Until Christ, this had to be constantly repeated because the blood of bulls and goats cannot remit sin, but were only a temporary covering for the past year (Hebrews 7:17-28; 10:1-14). Levi was the chosen tribe of Israel to whom earthly possessions were denied. At their consecration the nation presented Levi to God by laying hands on their heads, exactly as when they offered a common victim in substitution (Numbers 8:10; 11:14; II Corinthians 5). The priesthood, again, were the chosen from the tribe of Levi and the high priest was the representative of the entire priesthood, as well as of the whole nation, whose twelve tribes he had to bear on both his shoulders and on his heart (Exodus 28:12, 29). God receives the whole nation to favour in the person of the high priest (Zechariah 3; Romans 5:8-21; II Corinthians 5:14; Colossians 3:3). On the other hand, if the high priest sins, it brings guilt upon the whole people. His sin offering of a young bullock is identical to the sin offering for the nation (Leviticus 4:3). Thus when Caiaphas called for the death of Messiah, whose type he was supposed to be, he separated himself and his nation from God (John 11:49-54; Matthew 27:25). It was sacrilegious to kill the king, even at his own request, because he was "the Lord's anointed" (I Samuel 23:5-10; 26:9, 16; II Samuel 1:14; Lamentations 4:20). Thus when Caiaphas and Israel "cut off Messiah after threescore and two weeks" the nation was "cut off" from the grace of God and "Spiritual insensibility has come over the Israel nation until the last member of Christ's Gentile Bride is baptized into Christ" (Daniel 9:26; Romans 11:25; Isaiah 29:9-12). Once again the folly of British Israel/Christian Identity theory is manifest. The personal requirements of the high priest are in some things the same as those of the ordinary priest but as he was to reflect the whole fullness of the holy life in addition, he was to remain aloof from all defiling contact with death (Leviticus 21:10-15) so as in no way to interrupt his sacred function at the sanctuary (Leviticus 10:1), so we understand Luke 14:26 and Deuteronomy 33:9. He is not permitted to attend funerals or even mourn the dead (Leviticus 21:10). The services or ceremonies of consecrating a high priest lasted for seven days. The only specific difference between the consecration of the priests and of the high priest seems to have consisted in the four additional symbolical garments which, in the high priest's case were added to the coat, girdle, breeches and bonnet that belonged to the priests in general and the fact that while the priests were simply sprinkled with the perfumed precious oil, the high priest was anointed, for it was poured till it ran down to the hem of his garments (Leviticus 8:12; Psalm 133:2). Hence he was called the "anointed priest" (Leviticus 4:3, 5, 16). This symbolized the Holy Spirit with which our Lord Jesus was anointed without measure (John 3:34; Hebrews 1:9). The transfer of the garments of high priest from Aaron to Eliezer was a transfer of the Office itself (Numbers 20:26-28) without these holy garments, the high priest was only a private person and could not represent the people. Hence he is threatened with death if he appears before Jehovah without them (Exodus 28:35). The robe of the ephod was worn over the ordinary garment of a priest (Exodus 28:31-35). This pallim or blue robe of the ephod was of inferior material to the ephod itself, being only of woven work. It was also longer than the ephod and the tunic or coat would be visible only under it; also in the sleeves, since this blue robe had no sleeves, but arm slits. It had bells (representing thunder) and pomegranates (representing lightning) around the hem . . . "and his sound shall be heard when he goes into the Holy Place . . ." (Exodus 28:35; Leviticus 16:17; Revelation 6:1-8:1) — he was to be the sole person in the Holy Place during the entrance into the Most Holy Place when the "golden" was first removed but in the court many were present. He never wore the robes of beauty and glory in the Most Holy. The command respecting the bells was given before Aaron was restricted to entering the Most Holy Place only once a year. Indeed Leviticus 16:1 implies he entered the Most Holy Place as often as his inclination led him and it is therefore intelligible that he should have been commanded to warn the priests of his approach to the inner mysteries. But as these bells formed an integral part of the vestments, their use became restricted to the Day of Atonement. He only wore the Golden garments as far as the Holy Place where he put off his "Golden," washed in a golden basin, and put on his white robes and entered into the Most Holy. Thence he returned, assumed his golden robes, and went out to the people into the court. We are approaching another cleansing of the sanctuary. Mediation ended the Church Ages when Redemption was Over; lightnings and thunderings and voices issued from the throne, and the Mercy Seat in the heavenly Temple became the Judgment Seat (Revelation 4:5). In response to the call of the elders the Lamb advanced from the Outer Court where as the Sacrifice He had lain as a Memorial; taking the Book of Redemption He tore open the Seven Seals, and as Lion of the Tribe of Judah sat on the Throne as King of kings and Judge. The revelation of the Seven Seals indicted the world and is calling His Queen to the Marriage Supper. The bells of the robe of the ephod warned the priests who had left the Holy Place and were not allowed to re-enter till the bells announced to them that the entrance into the Most Holy Place had been completed. Hence "No man is able to enter into the heavenly Temple until the seven plagues of the seven Trumpet angels are fulfilled" (Revelation 15:8). So when Christ's Bride has made Herself ready, Brother Branham's Vial will be poured into the air for another cleansing of the heavenly sanctuary causing Satan to be cast out from heavenly places down to earth (Revelation 12:7-17; 16:17-21). Accompanied by thunders and lightnings, the sounding of the Seventh Trumpet will smite earth with a curse; and a great earthquake will sink Los Angeles beneath the Pacific (Revelation 8:5; 11:19; 16:8); the Temple of God in heaven will open revealing the ark of God's Covenant with Abraham, Isaac and Jacob—a sign of His favour toward Israel. This will signal the end of the Gentile dispensation, call the resurrection of the Church Age saints and the manifestation of the living Sons of God, then announce the revelation of Joseph's Antitype to Israel. After three and one half years when faith is quickened, 144,000 will recognize the Atonement and the Bridegroom and His Bride as their King and Queen, and all Israel will be born in one day (Revelation 14:2; 15:8; 19:6). The form of the vestment signified integrity since it was to be of one piece, and the blue colour, the heavenly origin of the Office of high priest to which the robe of the ephod was made subservient. The ephod consisted of two parts, like an apron (Exodus 28:5-14), one falling down behind, one in front. Its four colours represented the four elements. The Urim and Thummim was attached to the ephod. The Urim or blazing Lights of reflected Glory from the twelve stones indicated the will of God, while the Thummim or perfections, referred to the twelve tribes who, as Abraham's children were in the Covenant and bound to walk before God and be perfect. This breastplate in the midst of the ephod signified the shadowing forth of justification by the precious stones. It was called the breastplate of judgment and glory (Isaiah 61:10; Revelation 21:10-21). The New Testament antitype is the "breastplate of righteousness." It also represented the camp of Israel, the glory of the New Jerusalem (Isaiah 54:11-12), and the twelve months and signs of the zodiac. Two sardonyx stones were worn on his shoulders. Upon each was engraved the names of six Tribes, according to their generations (Exodus 28:12). Aaron wore them as a memorial so that Jehovah should remember them as they were carried into the Presence on the shoulders of the representative of the people. The high priest will also be king in David's stead as indicated by the insignia of office which he wore upon his shoulders (Isaiah 9:6). In order to signify that the representative bore the people into God's Presence, their names were engraved not only upon his shoulders but also over his heart on the Urim Thummim, the "Breastplate of Judgment" (Exodus 28:30; Leviticus 8:8). The government will be on Christ's shoulders, and He will rule the kingdom of Israel during the Millennium where the nation will be restored to Tribal order and land apportioned in relation to the Temple (Acts 1:6; Ezekiel 48). The high priest wore a mitre with a gold plate fastened by a ribbon of blue (Exodus 29:6). It was different to the turban of the priests and consisted of two turbans, the one being the bonnet of the ordinary priest and another turban of blue upon the first. His official garments were to descend from the one to his successor (Exodus 29:29). As the high priest was President of the Sanhedrin he was also the supreme judge. His special function however, related to the Day of Atonement. A KING is mediator of the judicial and executive Power of God among His people, acting in the Name of Jehovah. The king is also judge (II Chronicles 19:6; Psalms 2:10-11; John 5:27). We understand from Deuteronomy that Moses contemplated the contingency of a king being set over Israel as in the adjoining nations. The theocracy and the Law could be maintained as well under kings as under a commonwealth. God had promised, "I will bless Sarah, and give you a son by her, and I will bless him, and he shall become nations, and kings of nations shall be by him" (Genesis 17:16; 36:31; Numbers 24:17; Deuteronomy 28:36). Israel's request to Samuel, "Make us a king to judge us like all the nations" (I Samuel 8:5) was evidently inspired from Deuteronomy 17:14, so Samuel's language in presenting Saul as "Him whom the Lord has chosen" (I Samuel 10:24) alludes to Moses' direction in Deuteronomy 17:15, "You may indeed put a king over you whom the Lord shall choose. From among your own brothers you will put a king over you, not a foreigner who is not your brother". So the people chose their own king, but only in accordance with God's choice, and from their "brethren." This rule explains the guile of the Pharisees: "Is it lawful to give tribute unto Caesar, or not"? And the wisdom of the Holy Spirit: "But Jesus perceived their wickedness, and said, Why do you tempt Me, you hypocrites? Show Me the tribute money. And they brought Him a penny. And He said to them, Whose is this image and superscription"? They replied, "Caesar's." Then Jesus said, "Render therefore unto Caesar the things which are Caesar's; and unto God the things that are God's." When they had heard these words, they marvelled, and left him, and went their way" (Matthew 22:15-22; Jeremiah 30:21). Israel's fault was not that they wanted a king but that they set aside Samuel who was anointed by the heavenly King, on the pretext of his age, yet he would take a leading part in state affairs for the next thirty-five years. After the kingdom was set up the danger was no longer a physical return to Egypt, but a spiritual backsliding to Egypt (Hosea 11:5; Isaiah 30:1-2; Revelation 11:8). When set up, the king was but God's viceroy, enjoying only delegated authority. The words, "Jehovah is our Judge, Jehovah is our Lawgiver, Jehovah is our King" embody the theocracy (Isaiah 33:22). The land itself was His; and the people as His servants, could not be permanently bondservants to men (Leviticus 25:23, 42, 55). Instead of being of a distinct royal caste like Eastern kings, he was simply to be the first among equals, and like his subjects, bound by the fundamental Law of the nation (Matthew 23:9). If we rightly divide the Word of Truth and recognize our day and it's Message, we will see that Messiah's three principal offices are distinct and also successive. He had first to be the Prophet and lay down His life as Kinsman Redeemer for His Gentile Bride before He could be High Priest under the New Covenant, mediating for an election ignorant of the fullness of the Word so long as the Book was sealed with Seven Seals. Once He had redeemed the Church Age saints predestinated to be born-again under the times of PART-Word when the Book was sealed, redemption was over. His end-time Bride and the 144,000 elect Israelites were fully redeemed in Christ on Calvary and require no mediation as we are predestinated to be born-again by the revelation of our Seven Seals and Seven Trumpets respectively. The Church Age saints could not crown Him King until the end of the Age when redemption was over (Revelation 5:8-14), and the Body was (Gk.) 'teleios' "perfect, wanting nothing necessary to completeness," albeit His end-time Bride was not yet born-again. Then He claimed the Book of Redemption and sat down in the Judgment seat, and as King in the Office of Son of man He is the supreme Judge and as "first among equals" (Romans 8:17) able to execute judgment on his peers (Revelation 5:11-14; John 5:27). The revelation of the Seven Seals in 1963 began a cycle of events that will terminate man's day, end the Gentile dispensation, and begin the Day of the Lord with the Spiritual awakening of 144,000 elect Israelites and an outpouring of the wrath of God's judgments on this sin-cursed world.